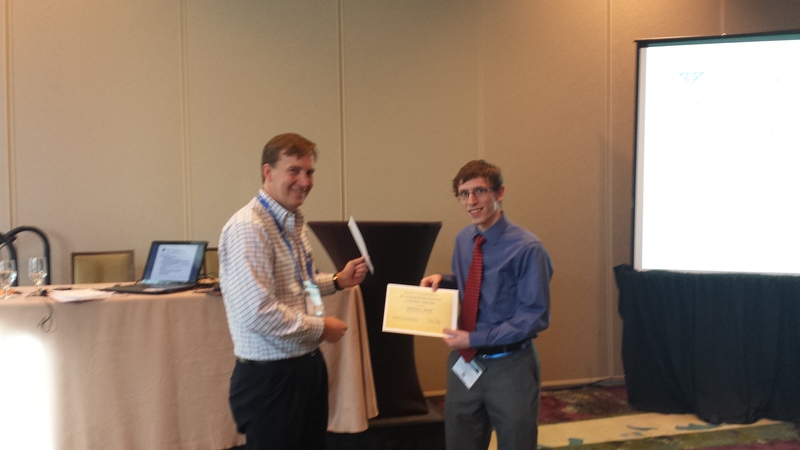 The 2014 Coryell Award winner, Matthew Marsh from University of Tennessee, Knoxville was recognized at the NUCL Business Meeting during the Spring ACS National Meeting in Denver, CO. Matthew did his undergraduate research project under the direction of Prof. Howard Hall. Matthew’s research project included the acquisition, synthesis and characterization of lanthanide complexes formed by complexation with 1,1,1,5,5,5,-hexafluoroacetylacetone (H2fac). The objective of the work is rapid separation of actinides, lanthanides, and other fission products as they apply to nuclear forensics, nuclear medicine, radiopharmaceutical development, and heavy element research. This need arises from the fact that current separation techniques often require extensive sample preparation, long counting times, and produce streams of mixed waste. In an effort to respond to this need, UTK has developed a plan to synthesize volatile compounds using H2fac and lanthanides (denoted Ln[Hfac]x) to produce volatile organometallics. These Ln[Hfac]x compounds can be placed in a gas chromatography/inductively coupled plasma time-of-flight mass spectrometer (GC-ICP-TOF-MS), where the GC will be used to perform the gas phase separations, and the ICP-TOF-MS will be used to qualify and quantify the resulting products. In this manner, elemental and isotopic composition and quantity can be readily determined. Matthew’s work has led to the discovery that the compounds containing La-Gd (excluding Ce and Pm) have coordination number of 9 with 3 bidentate ligands and 3 monodentate ligands. Similarly, the Tb-Lu containing compounds have a coordination number of 8 with 3 bidentate ligands and 2 monodentate ligands. Through this process Matthew has become proficient at interpreting IR, NMR, and mass spectrometric data. Furthermore, he has also helped in perform the initial separation using the GC-MS equipment and results are promising in that rapid gas phase thermochromatographic separation can be performed in much shorter times than conventional separation techniques.